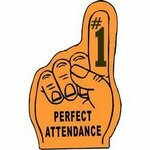 Bulls Gap School: Highlights - Attendance Matters! A number of students were recognized for their perfect attendance so far this school year! The group pictured below has attended school for 20 days in a row, and includes Miss Thacker's 2nd grade classroom, Mrs. Lawson's 5th grade homeroom, and many middle school football players. Keep up the good work!